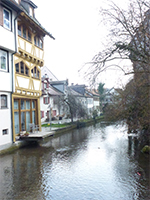 The Fishermen’s and Tanners’ Quarter in Ulm used to be the centre of medieval Ulm, which is first documented in 854. It is built around the channels of stream of Blau which leads into the Danube. The quarter is known for its medieval buildings which were used by craftsmen. Most of them were fishermen, tanners or shipbuilders. All of these professions benefited from the proximity to the river. Other professions included millers and soap boilers. The houses fit closely into the narrow alleyways. The Metzgerturm (literally: “Butcher’s Tower”) and the Schiefe Haus (“Crooked House”) were famous buildings as early as the Middle Ages. When Ulm reached its economic and cultural peak in the 16th century, the Fishermen’s Quarter was an important transfer site for various products. Many emigrants started their journey to Hungary in Ulm. They stayed for some days or even weeks in the Fishermen’s Quarter to better their finances before the journey or because they had to wait for a ship. Many worked for the local craftsmen und then went on their way towards Hungary on one of the Ulmer Schachteln (traditional ships, literally: “Ulm’s boxes”). The Fishermen’s Quarter today is a very lively district. During the summer, different festivals with their unique flair of the old city and narrow alleys attract many visitors. Through a guided tour, one can get to know the quarter’s history with its unique and sometimes curious stories. Special tours are offered at night-time with the guide being dressed up as a historical night-watchman. Typical channels at Fishermen’s Quarter with its medieval half-timbered houses. 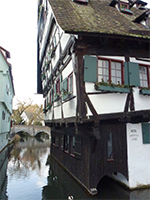 LEFT: The Schiefe Haus (crooked houses) seems to crookedly fall in the direction of the water. Today, it is used as a hotel. 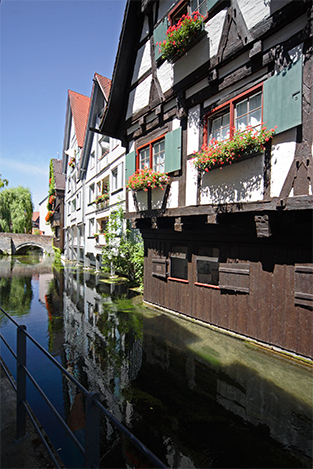 RIGHT: Ulm’s Fishermen’s Quarter is known for its complex channels which run close to the medieval houses. The Schiefed Haus today is a hotel. Septemner to May: every Wednesday at 8.30 pm, June to August, every Wednesday at 9.30 pm; 9 Euros; discounted 5 Euros.